Although the first year is really important for language development in children, major learning continues throughout a child’s early years. And learning language is a lifelong process. 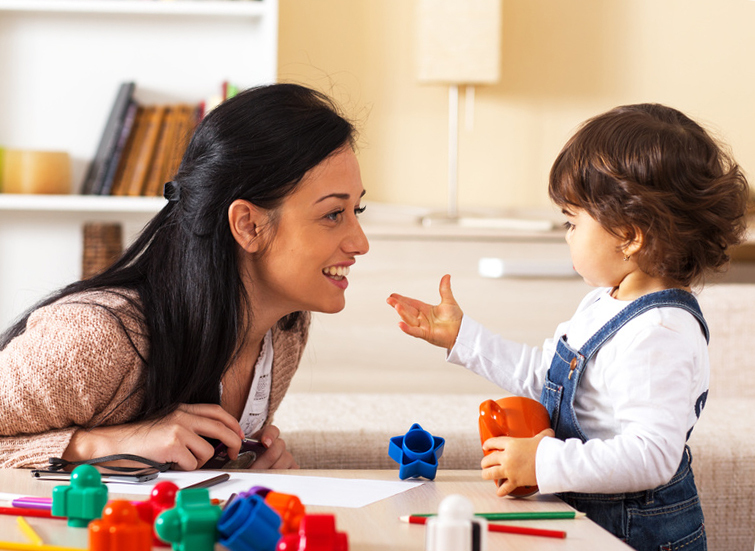 Language and communication skills are critical to a child’s development. Good communication makes them better able to engage in socialization and to learn from their environment and from formal classroom instruction. When we talk about communication we are talking about both speech which is the verbal means of communication and language which is using shared rules to put words together to express thoughts and feelings as well has to understand the meaning of language through both spoken and written communication. Since parents are a child’s first teacher, knowledge of language development in children improves their ability to interact with their child to stimulate and guide them in their ability to understand and communicate with their environment. Speech means producing the sounds that form words. It’s a physical activity that is controlled by the brain. Speech requires coordinated, precise movement from the tongue, lips, jaw, palate, lungs and voice box. Making these precise movements takes a lot of practice, and that’s what children do in the first 12 months. Children learn to correctly make speech sounds as they develop, with some sounds taking more time than others. Vocabulary is the store of words a person has – like a dictionary held in long-term memory. Grammar, or syntax, is a set of rules about the order in which words should be used in sentences. These rules are learned through the experience of language. Discourse is a language skill that we use to structure sentences into conversations, tell stories, poems and jokes, and for writing recipes or letters. Grammar involves two parts. The first, syntax, is the rules in which words are arranged into sentences. The second, morphology, is the use of grammatical markers (indicating tense, active or passive voice etc.). From birth on, children are programmed to develop speech and language. The first five years are most critical but language development continues throughout early childhood and on into adolescence. During the first five years stimulation of language development is important as the brain is both developing new nerve cells as well as multiple connections between nerve cells to serve the function of language both expressive and receptive. Lack of stimulation during this time could result in a child making slower progress or end up with poor communication skills. Later, we provide some tips for parents on how to help with language development but the basic suggestions are to spend lots of time talking, singing and reading to your child. In the early stages of language development, the brain is programmed to attend to speech sounds and begin to mimic them. Early on babies like to make sounds up on their own. Later they attempt to repeat sounds/words that they are exposed to from their environment. Knows an average of 900 words. Uses sentences that are three to four words long. Mispronounces 40 percent of speech sounds. Understands more words than able to use. Asks simple who and what questions. Tells simple events in sequence. Demonstrates beginning phonological awareness (hearing and recognizing the sounds of language). Uses words to express ideas and feelings. Usually follows requests and can be reasoned with. Begins to use reference books. Enjoys mysteries, adventure stories and biographies. Adjusts language and vocabulary to fit an audience, topic, or purpose. Develops vocabulary from textbooks and personal reading. Gives precise directions and instructions for more complex activities and tasks. Tells and retells stories in a formal storytelling format using descriptive language, story elements, and voice to create interest and mood. Demonstrates effective listening skills by exhibiting appropriate body language. Uses a variety of simple and compoundsentences of varied lengths. Verbally respond to your baby’s vocalizations. Around six months use shared attention and sign language (gestures). Point and name things that they see. Uses exaggerated voice when you describe things. Use feeling words. Sing to your child from babyhood until they ask you to stop. Have older children make up songs. Use songs to communicate things like time to go to bed, time to clean up, etc. Make of songs that are silly or that communicate affirmations related to their positive qualities. Initiate conversations with your child related to recent events, what they are doing. Make up stories along with your child. Each contributes. This not only stimulates language but thinking, creating and a sense of humor. Gradually increase the complexity of grammar and vocabulary you use to communicate. Provide children with expanded information about events, things they see and how they feel. Read interactively to engage their participation. Ask questions, use dramatic inflections, let them guess what will happen next, point to pictures and describe them, ask your child to do the same. Learn More About Interactive Reading. Have dinner together at the table and encourage conversation. You can use “Thorns & Roses” by each family member sharing one thing that went wrong and one thing that well during the day. When you go out to dinner, keep the electronics at home or turned off. After seeing a movie or TV show talk about what happened. Encourage reading. When they finish a book get their thoughts and feelings. Talk to your baby and treat her as a talker, beginning in her first year. Assume she’s talking back to you when she makes sounds and babbles, even when she’s just paying attention to you. When you finish talking, give her a turn and wait for her to respond – she will! As your baby grows up and starts to use gestures and words, respond to her attempts to communicate. For example, if your child shakes her head, treat that behaviour as if she’s saying ‘No’. If she points to a toy, respond as if your child is saying, ‘Can I have that?’ or ‘I like that’. Talk about what’s happening. Talk to your baby even if she doesn’t understand – she soon will. Talk about things that make sense to her, but at the same time remember to use lots of different words. It’s important for children to be continually exposed to lots of different words in lots of different contexts. This helps them learn the meaning and function of words in their world. Read and share books with your baby and keep using more complex books as he grows. Talk about the pictures. Use a variety of books and link what’s in the book to what’s happening in your child’s life. Books with interesting pictures are a great focus for talking. If your little one seems interested in a particular picture in a book, keep talking about it. If she seems intrigued by a boat, show her more boats and talk about them, too. Repeat her babbles back to her, ask questions, and interact with her. You can even try recording your child on a tape recorder and playing it back. Instead, repeat his statements back to him with the correct pronunciation or word usage. Give your child lots of praise for his efforts. The American Academy of Pediatrics recommends that children younger than 2 not watch television at all, and that children 2 and older view no more than two hours of quality programming a day. While some educational programs can be beneficial to kids, TV shows don’t interact with or respond to children, which are the two catalysts kids need to learn language. Computer games are interactive, but they aren’t responsive to a child’s ideas. Children in group child-care situations are more prone to ear infections, which can put them at risk for hearing loss and, consequently, language delays. If your pediatrician prescribes an antibiotic to treat an infection, make sure your child takes the correct dosage each day and uses it for the full prescribed time. When your child finishes the prescription, schedule a follow-up visit with your pediatrician to make sure the infection has cleared. A trip to the zoo, the aquarium, or a children’s museum will open up a whole new world for your child. As an added bonus, she’ll want to learn the names of all those fascinating creatures and fun activities she experienced.